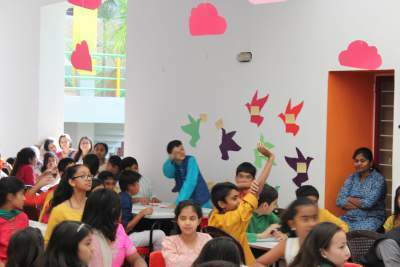 The CLPR team celebrated Republic Day on 26th January 2018 with the students and staff of Mallya Aditi International School, Bengaluru. 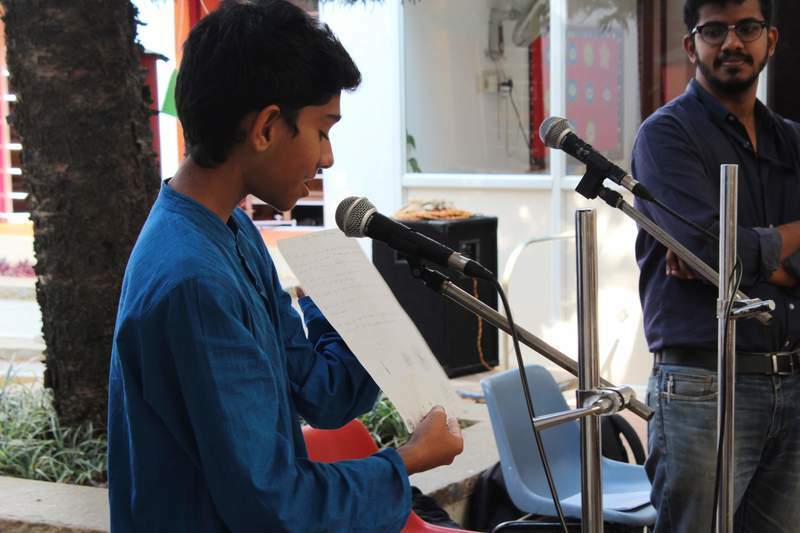 We created an immersive experience for students from the 1st to the 12th grade, through a range of activities that allowed them to engage with the Indian Constitution and its values. 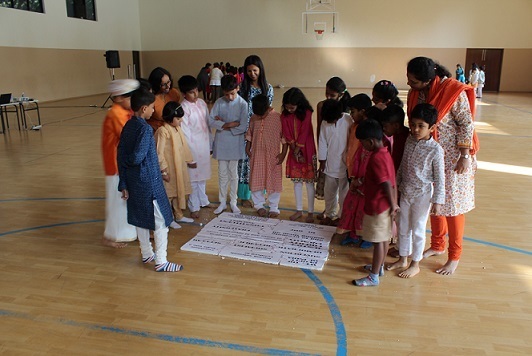 Jayna Kothari and Brototi Dutta along with the students from the 1st to the 4th grades engaged with the Constitution's Preamble. Students were divided into groups and had to solve puzzles based on the Preamble's text. All 6 groups successfully completed the puzzle, and the enthusiasm and discussion within the groups was a treat to watch! 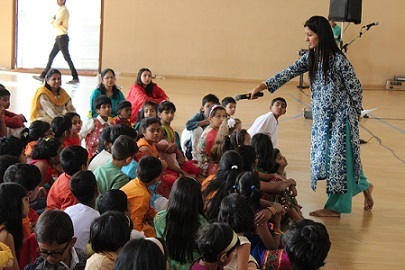 The group activity was followed by a presentation by Jayna Kothari. She explained the key concepts found in the Preamble – sovereign, socialist, secular, democratic republic, justice, equality, liberty, and fraternity – in a manner the students could relate to and appreciate. One of the many thought-provoking questions raised by the students during the session was: why do children not have the right to vote? Kruthika R began the session with a brief introduction to the Indian Constituent Assembly and the constitution-making process. She noted that the framers of our Constitution had to make choices that laid the foundations for the kind of nation India was to become: they chose democracy over dictatorship, a secular state over a theocratic one. After her initial remarks, she conducted a short quiz covering Indian constitutional and political history. The quiz began with: Why is 26th January 1950 celebrated as Republic day? There were multiple enthusiastic answers from the students: it was the day constitution was adopted, the day constitution was signed, the day the first draft of the constitution was complete. The quiz continued with other questions like: How many women were a part of the Indian Constituent Assembly? After the students attempted the questions, the answers were announced and key information and context around the answers were communicated to generate further curiosity and insight. The session then moved to the second segment: Mathew Idiculla introduced 10 key fundamental rights guaranteed in the Constitution. 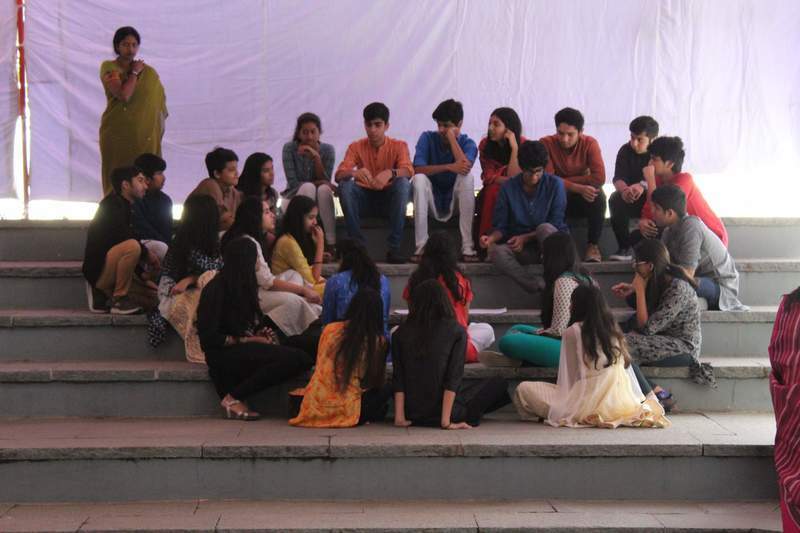 Then, the students were divided into 10 groups. One student from each group had to pick a chit which listed fundamental rights. The students had to imagine India without those rights, discuss within their groups, and identify 2 to 3 ways in which it affected them and their society. Towards the end of the exercise, one student from each group came forward to present to the entire audience on what the group had discussed. The students were very interactive. In addition to notes, they used drawings and art to communicate their ideas. The team that was assigned the right to freedom of speech and expression drew the flag of North Korea. They were of the view that if this right was to be taken away then India would be like North Korea, without individual freedom and liberty. Another team indicated that if the right to equality was removed from the Constitution then it would result in girls being denied an education, women getting paid lesser, female foeticide, harassment of transgender persons, the practice of untouchability etc. 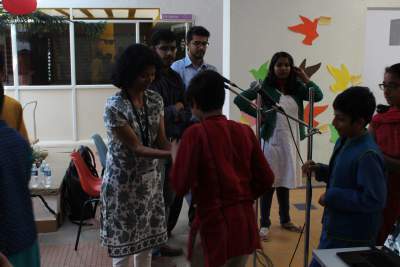 In her concluding remarks, Indu noted that the students had done a wonderful job by thinking critically and creatively. She ended by referencing two literary works: Diary of Anne Frank and Book Thief which would give the students an idea of how society would be without the guarantee of basic and fundamental rights. The session began with Sudhir Krishnaswamy giving the students a brief overview of the important institutions - Constituent Assembly, Committees and the Congress Assembly Party - that were critical to the framing of India’s Constitution and the division of labour that existed between them. He emphasised that the framers of the Constitution had to make constitutional choices in challenging circumstances: the members of the Constituent Assembly had to take decisions on issues that often did not have a clear answer. After Sudhir’s initial remarks, the students were divided into four groups and each group was given an issue to deliberate on. These were related to freedom of speech: censorship of films, the banning of books, freedom of speech in the context of a digital world, and freedom of the press. The groups spent the next 20 – 30 minutes discussing the issues among themselves and attempted to identify an approach to solve them. Each group then came on stage and briefly presented the issue assigned to them and how they dealt with it. The presentations were remarkable and showed the diligence and enthusiasm of the students in taking part in the activity and their close engagement with the task at hand. 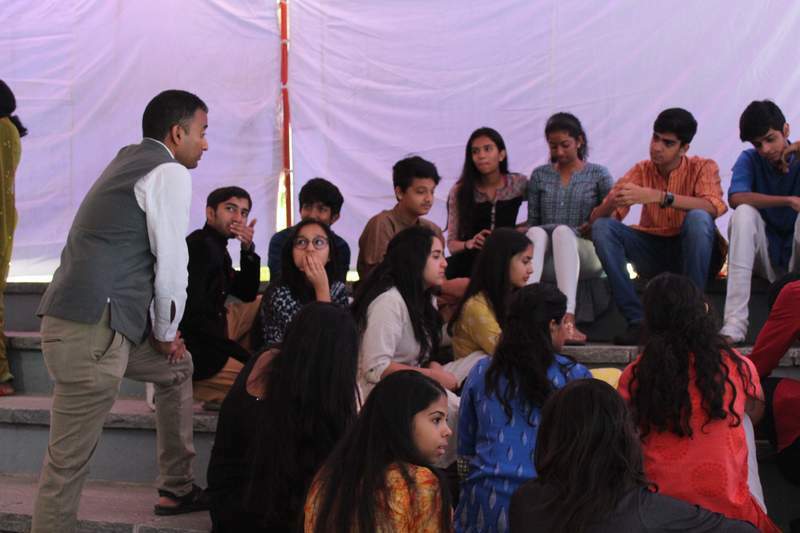 After the presentation, Sudhir ended the session by pointing out to the students that the framing of India’s Constitution was a process that was similar to what the students had gone through in their respective groups. He further added that just as the students had realised, deliberating and making decisions over complex problems were hurdles that the framers of the Constitution had to overcome as well. In such situations, what is important is not really the actual decision taken, but the fairness of the mode in which collective decisions are arrived at. 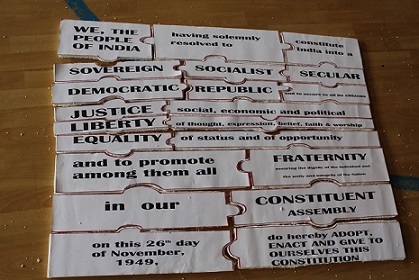 With this, the activity of the high school's students came to an end and the students gained a deeper understanding and appreciation of how the Indian Constitution was drafted.